News came out earlier this week that Google is moving forward on its earlier-announced plans of shuttering Chrome Apps across the board. As such, the move isn’t exactly a surpise at all. Instead, it is Google simply following through on what they’ve promised. So, what does this mean? Simply put, Chrome Web Apps won’t be available for Windows and Mac moving forward. This isn’t too big of a deal since few people used them to begin with. Chrome OS users won’t be affected immediately, but the change will come for all of us, too. What about extensions and themes? Those are just fine and will continue to work as expected. What Google is choosing to do here is actually very good for the entirety of the internet. Instead of encouraging web-based apps that only run in Chrome, Google is killing that whole initiative and pushing devs to put their efforts into Progressive Web Apps that will work across all modern browsers. Apps like Allo for Web, Google Photos, etc. are great examples of what can be accomplished with Progressive Web Apps. As this segment of computing marches forward, we should start seeing more and more highly-capable apps delivered via the browser from all sorts of sources. With web apps going away from one of the only places you can get them, how are users going to find these new Progressive Web Apps Google is encouraging devs to build? When you think about a web app, you mainly get to them and experience them via standard URL. There’s nothing to download or install, so how do we find them and use them? Right now, there’s not a great answer to that. I have some thoughts, though. 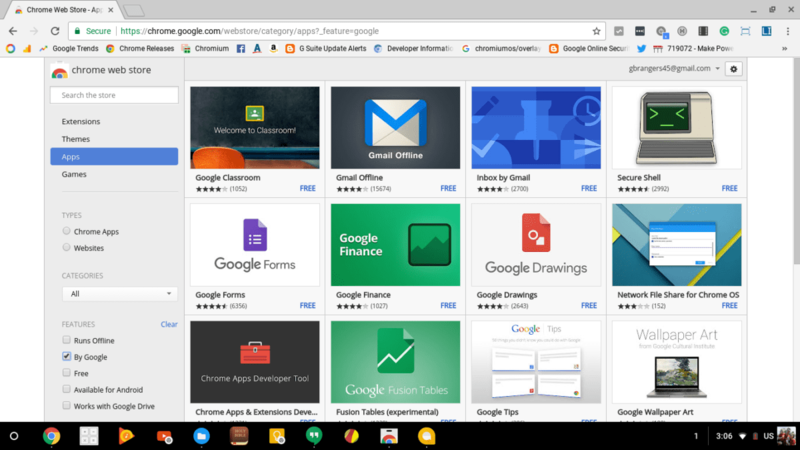 Right alongside the downloadable web apps in the Chrome Web store, there have always been plenty of web apps that simply push you to a particular website with nothing to download at all. For instance, imagine searching Allo in the Chrome Web Store and finding a listing that described the app with text and pictures (just like it does now for all apps) that simply redirected you to allo.google.com/web when you clicked the “install” or “use now” button. A storefront like this can still exist and Google can encourage developers to get their sites and Progressive Web Apps listed in the Chrome Web Store without the need to download anything. As it is already there, I don’t see this as a major step. Perhaps the Chrome Web Store would need to be rebranded, but the concept could remain intact: a one-stop shop for great web app experiences, extesions, and themes for Chrome. One other thing that feels odd about web apps is the fact that they run in your browser window with all of its menus, bookmarks, and tabs all visible. We’ve talked about this before, but opening anything that runs in Chrome in a stand-alone window is quite simple and makes the web app feel much more native. It’s as quick as hitting your 3-dot menu > More Tools > Add To Shelf > Open As Window. For Allo for Web, this is exactly what I do. It allows me to run Allo in a separate window, removing all the normal browser bits, and makes the whole experience feel more native. In the end, though, it is still just a Chrome browser window. This works on Windows devices as well. Sorry Mac users. So, what’s the problem? Most users don’t know how to do this, so when faced with using a progressive web app, it all feels a bit half-baked as they stare at a service nested inside a browser tab. I’m not sure how to make this more streamlined, but that process needs to happen soon. A simple button to “appify” any website or web app would make it much easier for users to adopt Progressive Web Apps. Oh, and it needs to work for Windows, Mac OS and Chrome OS. Maybe that’s a big hurdle, but I get the feeling it isn’t. However, until a much simpler, front-facing solution is in place, Progressive Web App adoption will remain limited when native apps are available for most users. If you could install Allo directly on your OS or have to figure out how to run Allo for Web in a stand-alone window, which would you choose? Most folks will unfortunately choose the installed app. There are many uses for powerful web apps that eclipse the scope I’ve talked about here, and their usefulness will continue to grow outside of what we even consider at this point. As barriers to adoption fall around them, I think the future of this type of software delivery will be limitless, and I can’t wait to see what developers do with this stuff in the near future.